Carte de la Republique des Suisses ou sont distingues les 13 cantons et leurs allies, les sujets de ces cantons et ceux de leurs allies. 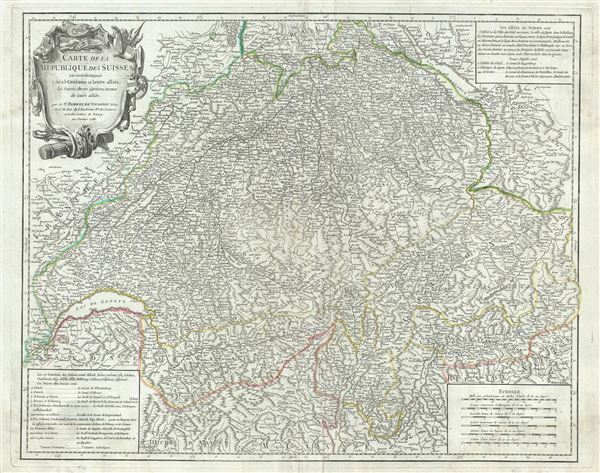 This is a scarce 1756 map of Switzerland by Robert de Vaugondy. It depicts Switzerland along with parts of Italy, France, Germany and Austria. The entire region is depicted in extraordinary detailed, offering both topographical and political information, with forests and mountains beautifully rendered in profile. The thirteen Cantons of Switzerland are also identified. A large decorative title cartouche appears in the top left quadrant while a list of Cantons in included in the bottom left quadrant of the map. Issued in the 1757 issue of the Atlas Universal. The Atlas Universal was one of the first atlases based upon actual surveys. Therefore, this map is highly accurate (for the period) and has most contemporary town names correct, though historic names are, in many cases, incorrect or omitted. Very good. Minor wear along original centerfold. Original platemark visible. Minor creasing. Some spotting and offsetting. Rumsey 3353.057. Pedley, Mary Sponberg Belle et Utile: The Work of the Robert de Vaugondy Family of Mapmakers, 282.